Disney World might make you think of kids and family vacations but Disney World is a very romantic place to be! More than 2500 couples choose to host their weddings at Disney World and even more make it the venue for their honeymoon. Many of these couples return year after year to celebrate anniversaries and keep romance alive. Try some of our romantic ideas. Even if you are at Disney with your kids - take some time out just for you and your loved one. 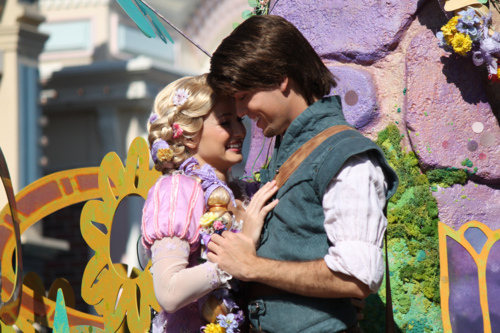 Disney World is the most magical place to be with that special someone. Take a luxurious spa treatment - together in the candle lit couples room. Call 407-842-2332 for more details. ** Snuggle close together on the Tower of Terror at night. The views across the park are awesome. ** Ride the transit authority monorail at Magic Kingdom after dark - magical! ** Take a walk anywhere in Disney World after dark but a particularly nice walk is from the Polynesian Resort to the Grand Floridian. ** Share an ice cream sundae at Ghiardelli's Ice Cream Soda Fountain at downtown Disney. Choose one of the yummy sundaes with two spoons and watch the world go by as you enjoy your treat. No Romantic vacation would be complete without a candle lit dinner or two . Here are our suggestions. The California Grill on top of Disney's Contemporary Resort has the most fantastic panoramic views of the magic Kingdom. Time your meal to coincide with the fireworks. The restaurant lights are dimmed and the music is piped in. But it's not just the sights that make this restaurant special - the food is to die for. Forget anything you might have read about Disney World food being substandard. Loads of locals eat at the Californian and you can't get a better recommendation than that. Victoria & Albert's at Disney's Grand Floridian Resort & Spa. This is the only restaurant in Disney World with a dress code so it's the perfect excuse to get your glad rags on. This elegant and intimate restaurant is the prefect place for a table for two. It's expensive but the service is impeccable and the food is award winning.